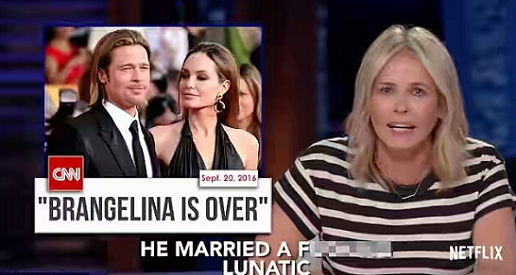 Jen's pal Chelsea Handler blasts Angelina Jolie on her Netflix comedy show Tuesday night and called out Brad Pitt for getting involved with her in the first place. The outspoken TV host characterized the Maleficent star as 'a f*cking lunatic' who had driven her husband to booze and pot as an escape. Handler, 41, is a longtime pal of the former Friends star, 45, and was among the guests at her wedding last year to actor Justin Theroux.